My surfing buddies are all gone. "Home Sea Home" should be back now. Home Sea Home is back, but so is the Hamlet title screen. The title screen itself isn't too big of a deal, but trying to change world generation settings in this build results in a crash. 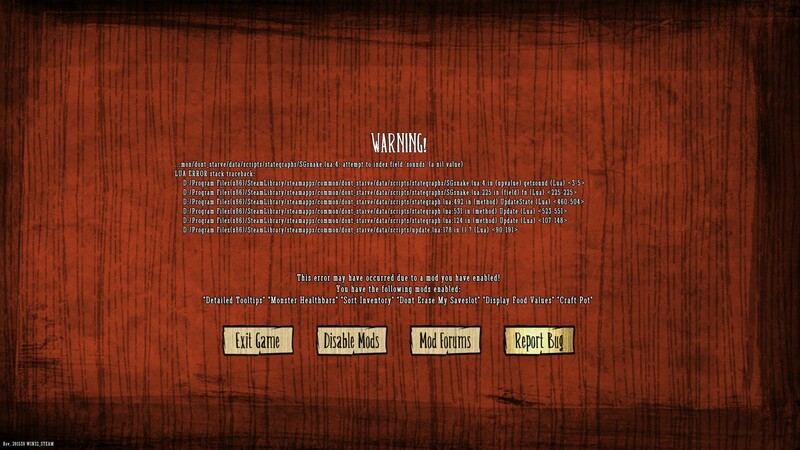 EDIT: I tried disabling mods one by one and I think the culprit is the "Moar Save Slots" mod which causes this crash. 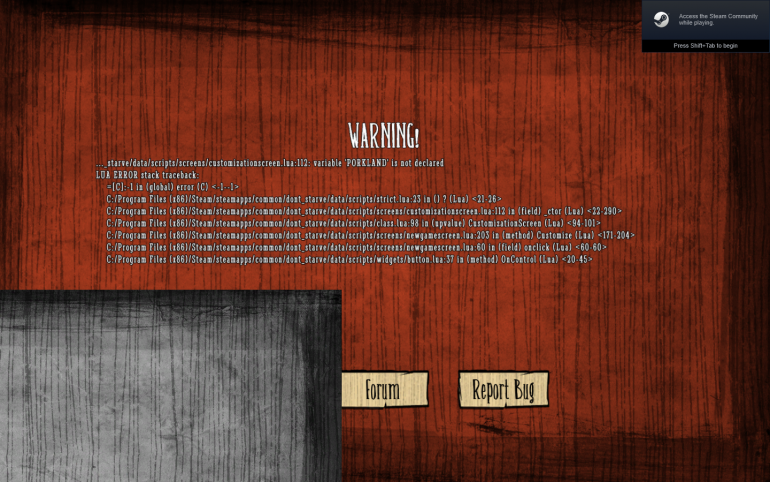 Disabling the mod seems to fix the issue, but re-enabling will cause a similar hang/crash. After the last update (Today) all my "Tar Extractor" and "Tar Slick" disappeared from my map. The latest update for DS just seems so bizarre. First, my save data was marked with the Shipwrecked crest despite me being in RoG. Fine, nothing big. Then, after entering Winter, the Fog sound dampening effect that used to be done by the Fog in Hamlet is now being applied to my game. I can barely hear any of the sound effects and haven't tampered with the sound settings in-game or on my computer. I take off my headphones and then the sound works properly, but plugging them back in continues the weird sound dampening effect. I can play any video off of YouTube with no issues, so it can't be the headphones alone doing this. I don't have the option to generate a Hamlet world. That option is unavailable to me. Edit: Some pics of my unmarked save file. We had to do an update to prepare for the coming Hamlet Early Access. There was an error that cause the above oddness with SW and Hamlet screens. That should be solved now. The sound dampening can be explained in that there was a bug with old DS that was fixed while working on Hamlet. There was always supposed to be sound filter fx for various seasons, but they were not working. I think the update brought that fix over. Also, there were some changes to the way the shield icon works when Hamlet was set up. The shield indicates which DLC the save file is compatible with. So that save file is a Vanilla world and is SW compatible (meaning you could jump to a SW world if you wanted). I still have the sound bug. So that doesn't seem to be fixed yet. The bug that sounds are not filtered? When winter hit I was barely able to hear many sounds effects. This was after the fix update too. 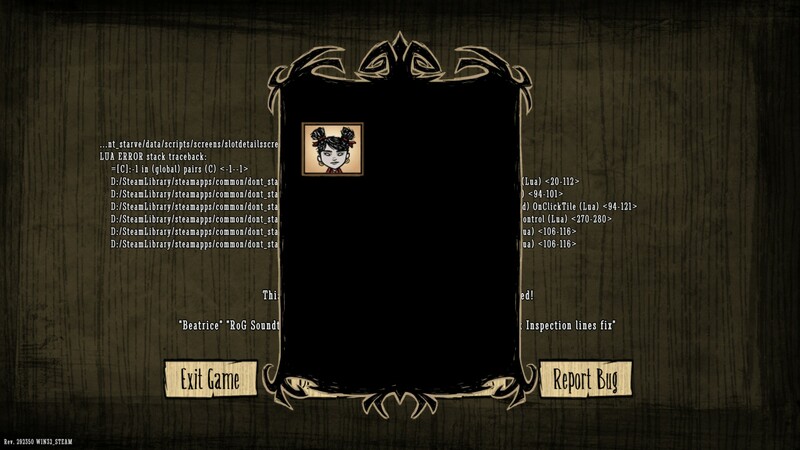 I did however restart the game just in case and for now it seems to be working like normal again. The bug might trigger only when a season change occur. To be clear, the bug was that there was no filtering before. Winter was supposed to have a filter. It's possible it's been broken so long, the values need to be reassessed. Jason, when will he release a new update? 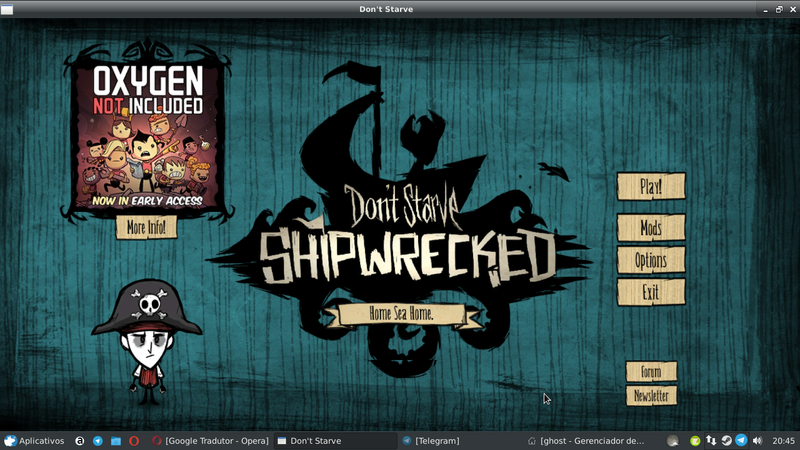 My world of Don't Starve Shipwrecked no longer appears "Tar Extractor" and "Tar Slick" disappeared from my map. Hey Galdino0800, does your SW title screen say "Home Sweet Home"? Did you happen to load and save your SW game yesterday evening? About 4:00? The sound bug was there for me when Hamlet beta started also (around 15 Oct) in shipwrecked worlds. Where most sounds were muffled even when I started the game in mild season. I had uploaded save files as bug report feature at that time. Sounds of tools much as woodchopping, mining played at like 10% of the volume. Whenever I restarted the game, it fixed the issue. Also, I had another sound-related crash. Now that I have reached summer the issue of sounds being extremely muffled persist again. And this time no matter the amount of restarting fixes it. For now I'll stop playing because I don't know if hound attack warning sounds and boss attack warning sounds are muffled too, And I don't wanna find out the hard way in my 2500+ days world. EDIT: I did tests on a brand new world and the muffling during summer still happen. Hound attack warning and Boss attack warning are muffled too. Since this mean it just doesn't affect old save files but also brand new saves it means that new people will get attacked almost without warning during summer. The same thing happens here in Summer season! I've been playing just fine, but since the first day of Summer the sounds are muffled.